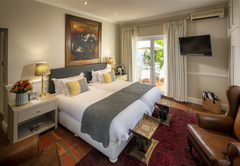 Spanish Farm Guest Lodge is a highly recommended guest house with self catering option, providing accommodation in Somerset West for tourists visiting the Cape Helderberg region. 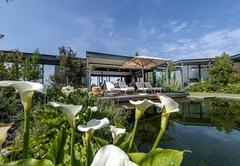 With its stunning scenery and panoramic views, lush indigenous gardens, luxury air-conditioned Guesthouse and Self Catering Villas, Spanish Farm is the ideal base from which to explore the beauty of the Western Cape. 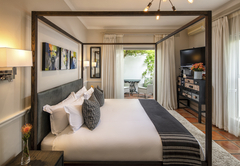 From here you can visit South Africa's most famous wine routes including Stellenbosch, Franschhoek and Paarl, or set off on safari to nearby game lodges in the Klein Karoo area. 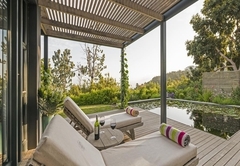 Spanish Farm offers Guesthouse and Villa accommodation. 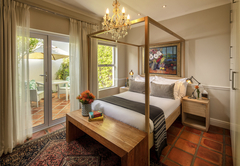 The guesthouse offers three spacious bedrooms and is surrounded by exquisite gardens. 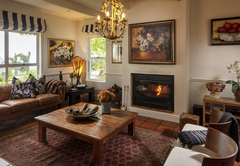 In winter a comfortable living room allows our guests to relax and read in front of the wood-burning fireplace with a glass of wine and listen to music. 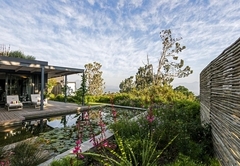 Guests have the use of a sparkling rim flow pool in the manicured garden. The guest house room has a queen sized bed and an en-suite bathroom has a shower . The room leads onto a small private patio. This room has a king sized bed with the option of twin extra length beds. 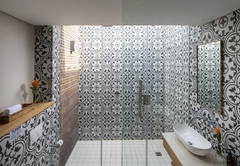 It leads onto a private patio and has a full bathroom. The third room has two single extra length beds, a full bathroom with a lovely outside shower and also leads onto a small private patio. 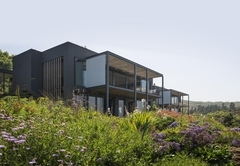 The Villas are set in indigenous gardens with beautiful fynbos vegetation and birdlife. There are private nature pools with wooden decks for guests to sunbathe in privacy. For the coffee lovers, each villa has their own Nespresso coffee machine. 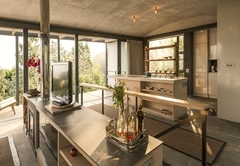 The villa’s have a TV, a Wi-Fi connection, security, safety deposit boxes in the bedrooms, hairdryers, under floor heating and heated towel rails. 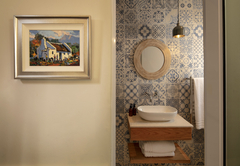 Our rose cottage is a self-catering cottage. 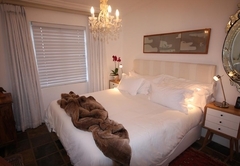 The room has a king-size extra length bed, is en-suite with shower over bath. The unit has a fully equipped kitchen with fridge, stove top and oven, dishwasher, washing machine and a Nespresso coffee machine. The cottage offers access to a private sundeck with the option to the use of a private Jacuzzi at an extra cost. The honeymoon villa sleeps two people and has a king size bed. 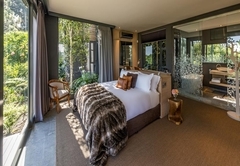 The villa has a dining room, a lounge with a slow combustion fire place, and the lounge leads onto the wooden deck which surrounds the nature pool. The kitchen is fully equipped with a free standing island. 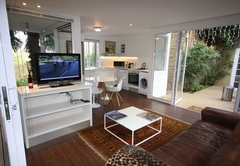 It also has washing machine, a dishwasher, a microwave oven and a gas hob with an electric oven. 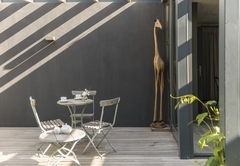 Bedroom one has an extra length king size bed with a modern en-suite bathroom which has a double basin, a beautiful free standing bath and it leads onto a private outside garden with an outside shower. 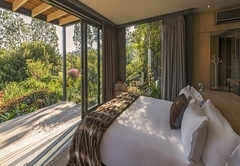 Bedroom two has extra length twin beds with a modern en-suite bathroom which has a shower, a double basin and also leads onto a private outside garden. The villa’s have a lounge with a slow combustion fire place and a dining room which leads onto the garden with their own nature pools. 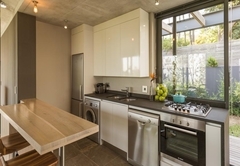 The kitchens are fully equipped with a free standing island and washing machine, a dishwasher, a microwave oven and a gas hob with an electric oven. The Ground Floor Apartment 1 is separate from the other Villas and leads down with stairs through the garden. This 100 square metre open plan apartment sleeps two people in an extra length king size bed. 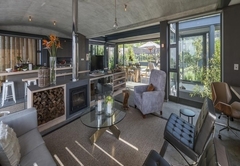 The modern open plan living area has a fully equipped kitchen with a dishwasher, washing machine, tumble dyer, microwave, oven and induction stove. 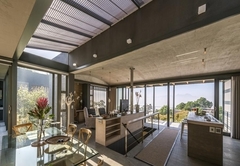 The dining room and lounge area opens onto a wooden deck which overlooks an indigenous fynbos garden abundant in bird life. 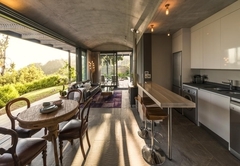 The villa has a TV, Wi-Fi connection, under floor heating, a dining room table which seats four people comfortably and a separate dressing room. 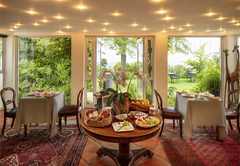 Delicious Continental or full English breakfasts are served either in the sunny breakfast room or in the garden overlooking the ocean. 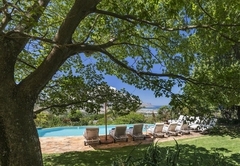 Spanish Farm is 20 minutes' drive from Cape Town International Airport, 40 minutes' drive from Cape Town and the Victoria & Alfred Waterfront and close to many outstanding golf courses, a number of major shopping centres, beautiful beaches and excellent restaurants. The guest house room has a queen sized bed and a bath room with a shower. 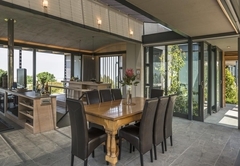 The room leads onto a small private patio. The en-suite bathroom has a shower. The third room has a King size extra length bed, a full bathroom with a lovely outside shower and also leads onto a small private patio. The room has a queen sized extra length bed, a small kitchenette which consists of a fridge and a stove top. The room has a Nespresso coffee machine and an in-bath shower. 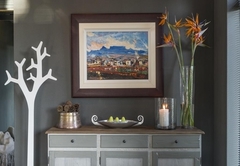 There are lovely views of the Helderberg mountain from the cottage. 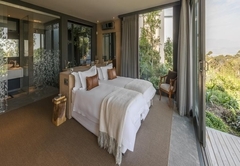 The villa has a king size bed, and is architecturally designed with magnificent sea views.The villa has a dining room, a lounge with a slow combustion fire place, and the lounge leads onto the wooden deck which surrounds the nature pool. 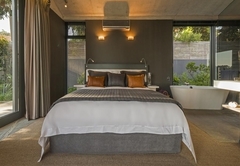 Bedroom two has extra length twin beds with a modern en-suite bathroom which has a shower, a double basin and also leads onto a private outside garden. Both bedrooms have reading lights on the headboard for a good reading experience. 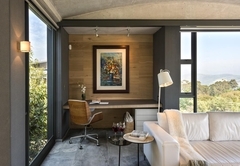 The villa has a TV, Wi-Fi connection, under floor heating, a dining room table which seats four people comfortably and a separate dressing room. Fabulous location and stunning views. We stayed in the villa. It is very well equiped, luxurious and beautiful. I have rarely seen such a well thought-out self catering unit. The linnen is of an excellent quality and the nespresso coffee machine is great. Response timeSpanish Farm Guest Lodge typically responds to requests in 5-10 minutes.